THEY were nervous, their superstar said so himself. But when they finally got settled and played basketball the way they were capable of playing, there was no stopping the Oklahoma City Thunder. "Just this being The Finals, we were kind of nervous. That's something we can't...it can't happen next game or the rest of the series," said Thunder forward Kevin Durant of his team's slow start which pushed them down a 13-point hole, 39-26, early in the second quarter. But the Thunder, as they have done so routinely in these playoffs, eventually regained control by taking both their tenacious defense and explosive scoring on a championship level. And by the time Game 1 ended Tuesday night at the Chesapeake Energy Arena in Oklahoma City, the Thunder had soundly beaten the Miami Heat, 105-94, to seize a 1-0 lead in the best-of-7 NBA Finals. Durant, the NBA's scoring champion the last three years won his much-ballyhooed duel against Heat forward LeBron James, the reigning and 3-time league MVP. The 23-year old Durant finished with 36 points, 8 rebounds and 4 assists. He made 12 of 20 field goals, 4-of- 8 threes and 8-of-9 free throws. More importantly, he was clutch in the fourth quarter. Durant drilled a 3 in the 6:29 mark and pushed OKC further ahead at 87-81. He then stretched that lead to 95-87 with a pair of free throws in the final 2:29, and when the Heat kept charging gallantly back, Durant finished them off with an assist that yielded a Nick Collison dunk and a comfortable 99-92 Thunder cushion with just 77 seconds to go. LEBRON James acquitted himself well with 30 points, nine rebounds and four assists, inarguably his best game yet in three NBA Finals appearances. But The Chosen One wasn't a factor in the fourth quarter, scoring only seven points as the Thunder slowly but surely pulled away. The Heat started Game 1 on fire, jumping to a 20-10 lead when Shane Battier and Mario Chalmers kept hitting open 3s. Miami padded the cushion to 39-26 and kept a double-digit lead almost throughout the second quarter before a late surge by Oklahoma trimmed the Thunder deficit to 54-47 at halftime. That surge spilled through the third quarter, where point guard Russell Westbrook went ballistic, scoring 12 points as the Thunder went on a 27-point tear while holding Miami to a meager 19. Westbrook tallied 27 points overall with 8 rebounds and 11 assists. He and Durant outscored the entire Miami Heat team 41-40 in the second half, an impressive show of might for OKC's Big Two. "We had a good game plan to start the game but the third quarter really hurt us. They made shots and we missed shots. They made more plays, especially offensively," James told the Associated Press. Besides Durant and Westbrook, only one other Thunder finished with double figures in points -- Serge Ibaka (10). But Oklahoma got quality minutes from Nick Collison who had 8 points and 11 rebounds and Thabo Sefolosha who chipped in 9 points while shadowing James the entire fourth quarter. James Harden, the reigning NBA Sixth Man and one of the pillars of OKC's offense, played only 22 minutes due to foul trouble. He notched a below-par 5 points. luxury from his All-Star cohorts as Dwyane Wade missed 12 of 19 shots to finish with just 19 points while Chris Bosh, who was terrific against the Celtics, managed only 10 points in 34 minutes. Miami converted only 36 of 78 field goals (46.2 percent), 8-of-19 3s (42.1 percent) and 14-of-18 free throws (77.8 percent). The Heat fell to 4-5 on the road in these playoffs. 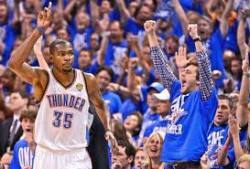 The Thunder, meanwhile, remained unbeaten at their homecourt in these playoffs, 9-0. Buoyed by their fans, the noisiest in the NBA, the Thunder shot well in Game 1 --- 40-of-77 from the field (51.9 percent), 5-of-17 threes and 20-of-27 free throws. They outrebounded the Heat, 43-35, and enjoyed a huge advantage on fastbreak points, 24-4.